Ipso Photo is a photography exhibition without photographs; instead it is of or derived through photography (ipso - by, through). It considers the enduring influence of photography on non-photographic artforms. In particular, it aims to locate some recent installation and sculptural work in relation to current debates about photography. A burgeoning dialogue is currently occurring between photographic representation and non-photographic artforms, such that traditional definitions of photography as material print no longer seem adequate to account for its widescale influence within the visual arts. There seems to be a preoccupation with the procedures of photography quite apart from the final image. Photographic historian and theorist Geoffrey Batchen has identified this tendency as part of a post photographic scenario in which the boundary between photography and other media like painting, sculpture and performance has become increasingly porous. Batchen argues that each medium has absorbed the other, leaving all irreparably changed. 1This inevitably leads to the confusion of distinctions and definitions of media, and subsequently, to a more general definition of photography which supports its recent, wide-ranging applications. For example, conceptual and spatial relations in recent installation work are often shifted through photographic characteristics such as single point perspective, differential focus, colour casts and ambiguities of scale. This is true of recent work by the artists in Ipso Photo and many others besides. Increasingly, the current influence of photography within installation practice can be identified beyond the photograph per se  that is, beyond the mere two dimensions of flat representation  and in the configuration of gallery space according to the model and characteristics of photography. Chris Fortescue remarks of his recent installations that photography provides a framework through which all of the relationships in the work, and between the work and the audience, are articulated. And Margaret Roberts describes her installations as if set up by or through a camera. What definition of photography is sufficient to these descriptions and practices? There can be no denying the enormous impact of the camera upon the general perception and representation of the world in art, science and everyday life. The camera has inscribed divergent phenomenon within a system of monocular perspective; bringing objects and events into an ideal representational space, which enables them to be identified and classified according to their rationalised appearance. Certainly, this influence has been constant within Western art since the Renaissance and has predetermined our fundamental perception of space. One of the principal aids in attaining this formal correctness in representation was of course the camera obscura, the filmless precursor to the modern camera. The history of the camera obscura prior to the invention of photography in 1839 is often referred to as the prehistory of photography. But the practice of photography after 1839 cannot be entirely dissociated from its derivation through the use of the camera obscura in painting and sculpture since the Renaissance. In short, that a word was coined in the mid nineteenth-century to describe one particular use of a camera does not divest the subsequent practice of photography of its origins in the history of perspective. The camera, like the camera obscura before it, remains predisposed to formal correctness; to the shapes bodies assume when they are seen. The development of photography was not therefore a rupture or clean break in the history of art, nor the invention of a new medium, but simply a threshold in the long and enduring history of perspectival representation. In fact, photography simply consolidated the objectivity of perspective as a representational system. It dissociated the system of perspective embodied in the camera obscura from its human requisite and proved the universal operation of perspective independent of human intervention and action; as if the laws of vision were universally operative beyond the body. Furthermore, the development of mechanical means of recording an image - in conditions analogous to those of human vision but in the absence of a percipient - paradoxically signalled the redundancy of human agency in photographic representation. Photography suggested a relationship between perceived and percipient as a matter of optics. Thus photography replaced the subjective dimension of perception and representation with a rationalised approximation of appearances according to the laws of perspective and photo-chemistry; an indexical image which stood in for direct visual experience. Victor Burgin has isolated the form of subjectivity which the [camera] constructs through its single unique point of view. He says: 'The perspectival system of representation represents, before all else, a look' 3 Similarly photography represents, before everything and after all, a way of looking which - despite its mechanical separation from human agency - constantly refers back to a subject or viewer. The viewfinder, like the photograph, presumes a human optic. These persistent references to a subjective locus ultimately haunt the supposed objectivity of photographic representation and signal the diverse experiences and interpretations which constitute any so-called single point of view. The reduction of heterogeneous experiences to one mythical vantage point is also a function of the instantaneity of photography. Yet if we were to slow, or separate, the constitutive moments in the photographic process, the true subjective dimension of visual experience would be returned to complicate the claims to objectivity of photographic representations. The photographic image would appear not as a thing in itself, but as the end product of a particular way of seeing which effaces the elaborate procedures which constitute it. Each of the works in Ipso Photo slow down and enlarge the multi-faceted minutiae of the photographic process; they give it a duration in which the moment between object and image is idle and exposed to the speculation and scrutiny of the viewer. And this is precisely the strategy in excluding photographs from the exhibition; to examine more closely what occurs in that split second of representation without recourse to an image. As representation, the photograph is manipulated, framed and constructed at every stage of its production. The camera, for example, has one optic not two, it reduces a perception in three dimensions to a representation in only two, it renders the peripheries of human vision clear and focused and it clearly limits or frames what is viewed. Ipso Photo points to this breach between human perception and representation in and through the model of photography. The work of Margaret Roberts is predicated on these differences. Her iron oxide wall and floor drawings are first proposed in two dimensions; as if, she says, the gallery space is a flat abstract pattern over which the additional pattern has been drawn. 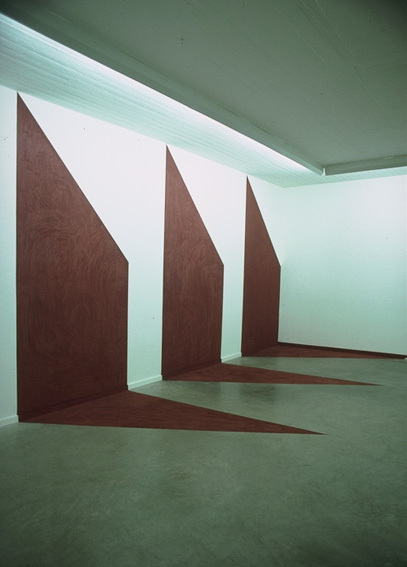 This is most obvious when looking at the photographic documentation of her installations in which the function of single-point perspective makes perfect symmetrical sense of the drawings relation to the gallery architecture. In direct encounter, however, this point of view is simply one point along the viewers physical sojourn through the gallery. And even upon reaching that single point of the works geometrical resolution, two eyes hamper the full effect. It is truly up to the monocular lens of the camera to manifest the overall design, all at once and in even focus, rendering the drawing in a fixed, ideal regard. Roberts describes this difference as a matter of the body which make[s] the distinction between three dimensional space and installed drawing (2D), whereas the camera has nothing at stake in blurring or equating these distinctions. The body haunts the pretensions of the eye to resolve these 2D designs across three dimensions; the camera, of course, remains a disembodied eye. In traversing the installation, the physical disposition of the body confronts the contrary appearance of things, rattling the invisible cage of perspective which is suggested everywhere around us by the geometry of the drawing. More recently in Roberts drawings there is more than one privileged point of view. The viewer finds an evenly-paced, formal respite from the ambiguity of form and the approximate efforts of vision to make sense of the inscribed geometry. As one commentator remarked of this later work, the effect is cinematic, or rather it would be if our bodies were properly calibrated and synchronised to the scopic field of the camera. But they are not, and this is the point it seems of Roberts work: to confound the hallowed logic of sight and the representation of space with the bodys own rhythms and sways. In Marie Sierra-Hughes sculpture, the operative principles of the camera provide a model for delineating the interior and exterior of the gallery. In fact, the gallery is reconfigured as the interior space of a giant camera obscura (or eye). 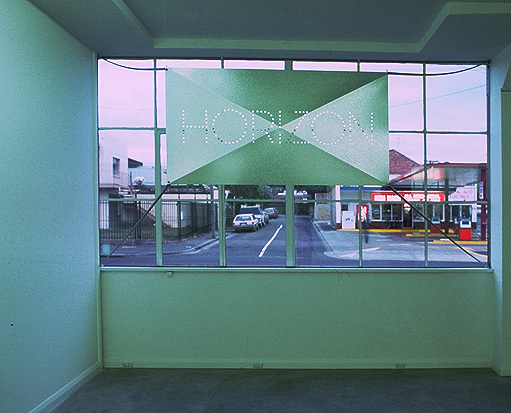 A large steel aperture is fastened to the front window bay of the gallery suggesting a lens through which a vista of the outlying urban landscape is introduced to the gallery, focused and distilled into a single text - horizon. The word is spelt out in perforations across a pressed metal form. The word also appears inverted - and smaller - in a series of perforations across the wall opposite the window. And again on the reverse side of this wall. Thus the exterior landscape is reduced to a nominal (textual) form which is otherwise transformed, inverted, scaled down and copied in a simulation of standard photographic procedures. The work enacts an apt parody of a photography gallery which converts the outlying world into a succession of images for exhibition. Insofar as this metaphorical space is also lifesize (and not eyesize), the viewer becomes physically implicated (entangled) in the perspective lines drawn from outlying objects and events to their textual referent on the gallery walls. Far from empty, the gallery is replete with the potential inscription of all that lies beyond the pane. It is as if the viewer is inside the camera, displaced on the dark side of the ground glass screen; traversing the plane of the simulacra, anticipating the precession of effect. Counterpart to Sierra-Hughes monstrous optic is Philip Watkins oversize reconstruction of the single lens reflex action of many modern cameras. A series of reflective panels transfer the mute action of Johnston Street onto a paper screen. Both passing cars and stationary buildings surrender their precise forms to the even dissipation of light across the pearled surface of the mirrors and screen. As if in Platos cave, we witness the world outside as a series of beguiling shadows and lights. And as we move before the screen the scene changes in a flux of light. In his previous paintings, Watkins focused on a particular moment of looking ... where painted shadow and light coincide with actual shadow and light, that is, where the fiction of representation ends and the fact of the surface or the support begins. In his installation this ambiguity is transferred to real time and real space. The abstracted representation of the street confronts its origins over roughly the same time and place. In fact, it is the slight dislocation of the outlying scene which makes all the difference to its simultaneous appearance on the screen. That split second of reflection (the speed of a shutter) is capable of such gross distortions that the simultaneity of photography is overwhelmed by its ulterior potential to radically transform appearances. Resemblance breaks down, as it ultimately does in even the best tromp loeil, to reveal the artifice of representation. After all, it is only the shere speed of light which sustains the verisimilitude of photography. In Chris Fortescues work the wall and floor are demarcated according to standard interior hues; a sky blue wall and a salmon carpet. 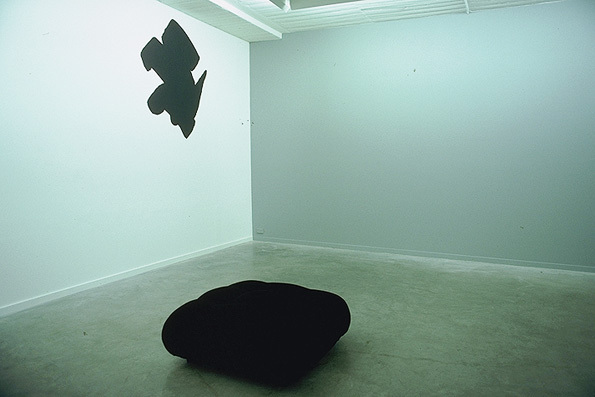 An illdefined blob on the wall corresponds to a deep blue velour cushion sitting on the carpet; they are positioned within their respective fields of colour according to the same co-ordinates. Like a box camera, the two fields appear to replicate each other; one reflecting the other across 45 degrees. Yet the evident mutation of form and colour suggests, once again, the transformative potential between these quasi-photographic planes. Another reference is perhaps made to the social space of photogaphys reception. Its as if the debate about photographic representation - the critique of its objectivity and accuracy - had leaked out of the image and seeped into quotidian forms, such that the domestic environment of the photograph is suffused with the formal and symmetrical relations which produce the image. Fortescue describes these tableaus as setting up a paradox between sensation and representation. Effectively, Fortescues work operates in the reverse direction from the other work in Ipso Photo; from everyday space back to representational space. And so the contrast between these two kinds of space is experienced in a different register, not so much in the illfit of rigid and imposed photographic geometries, but in a resounding domestic oddity or weirdness. The body is caught between its sense of homely abandon and formal occasion; precisely between repose and pose. These four works participate in an ongoing critique of photography. They question the objective brokerage between photography and the world by highlighting the differences between photographic and lived space, between the appearance of things to the camera - their photographic representation - and their direct, lived experience. They also move beyond a mechanical conception of photographic space to suggest the kinaesthetic and conceptual experiences that are inevitably effaced in the split second of photographic mediation. The emergence of this kind of work at a time when photography is shifting from analogue to digital means, reinforces a transformation in our understanding of representation which attends the new digitised image without trace. Where the analogue photograph is intrinsically bound to the real by its verisimilitude and indexical origins, the digital image arrives without these claims; its link to the real is (at best) insubstantial and (most frequently) remote. In its objective correlation with viewers experience, analogue representation now appears naive and insufficient. Certainly, the works in this exhibition are testament to the fading influence of this kind of photography. In each case, photographic representation is invoked and at the same time displaced by subjective experiences in real time.